I know what I am expecting, to hear total gravel, marbles in the mouth, rocks on a washboard, old pure British guy voice. So he starts talking. I hear this sweet voice with an subtle undercurrent of an English accent. Yes it’ an expatriate British accent. He’s been in this country too long the gravely Brit is gone, leaving a flat American accent layered on top of the distinctive diction and vocabulary of an English school boy. His original accent comes up here and there. I’m surprised at the sweet lilt in his voice, he doesn’t sound old, doesn’t sound like a guy that’s been sucking on a cigarette for the last 55 years, like a guy that whose face is slashed right left and center with drug, hard life and nicotine wrinkles. 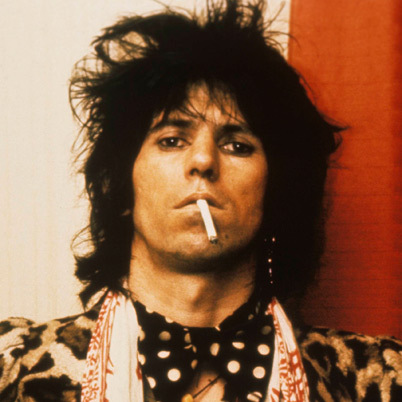 I used to be obsessed with Keith Richards starting when I was a sophomore in college, I have no idea why. I wasn’t attracted to him I just thought he was as cool as hell .I use to have a T-shirt with his head multicolored Andy Warhol style bobbing on each breast. I would get lude stupid comments whenever I wore it but all I knew is that I was supporting the man. One of my best days ever from that time was meeting another girl that was also obsessed with Keith like me the little bookstore I used to work in. 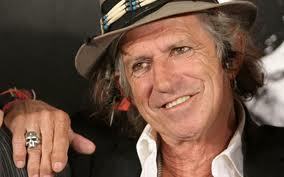 We spent hours sharing all things Keith. The only time I hear all those years of hard living through the radio was when he laughed. It is more like a cough the waves of his diaphragm heaving the barnacles of too much drinking, smoking in lungs barely hanging on. I didn’t expect his voice to be sweetish. Now I wish he would tell me a story.